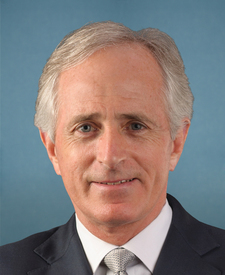 Compare the voting records of Bob Corker and John Barrasso in 2017-18. Represented Tennessee. This is his 11th year in the Senate. Represented Wyoming. This is his 11th year in the Senate. Bob Corker and John Barrasso are from the same party and agreed on 93 percent of votes in the 115th Congress (2017-18). But they didn't always agree. Out of 574 votes in the 115th Congress, they disagreed on 42 votes, including 7 major votes. Dec. 18, 2018 — A bill to reauthorize and amend the Marine Debris Act to promote international action to reduce marine debris, and for other purposes. Motion Agreed to by a margin of 75 votes. Dec. 11, 2018 — A bill to provide for the reform and continuation of agricultural and other programs of the Department of Agriculture through fiscal year 2023, and for other purposes. Conference Report Agreed to by a margin of 74 votes. Feb. 15, 2018 — In the nature of a substitute. Cloture Motion Rejected by a margin of 21 votes. Feb. 9, 2018 — A bill to amend title 4, United States Code, to provide for the flying of the flag at half-staff in the event of the death of a first responder in the line of duty. Motion Agreed to by a margin of 43 votes. Dec. 2, 2017 — To provide for reconciliation pursuant to titles II and V of the concurrent resolution on the budget for fiscal year 2018. Bill Passed by a margin of 2 votes. Sept. 7, 2017 — A bill to enhance the transparency and accelerate the impact of assistance provided under the Foreign Assistance Act of 1961 to promote quality basic education in developing countries, to better enable such countries to achieve universal access to quality basic education and improved learning outcomes, to eliminate duplication and waste, and for other purposes. Motion Agreed to by a margin of 63 votes. July 26, 2017 — Of a perfecting nature. Motion Rejected by a margin of 14 votes. Dec. 18, 2018 — To require the Director of the Bureau of Prisons to notify each victim of the offense for which the prisoner is imprisoned the date on which the prisoner will be released. Amendment Rejected by a margin of 33 votes. Amendment Rejected by a margin of 35 votes. Dec. 17, 2018 — A bill to reauthorize and amend the Marine Debris Act to promote international action to reduce marine debris, and for other purposes. Cloture Motion Agreed to by a margin of 70 votes. Dec. 13, 2018 — To clarify that this resolution prohibits United States Armed Forces from refueling non-United States aircraft conducting missions as part of the ongoing civil war in Yemen. Amendment Agreed to by a margin of 17 votes. Nov. 28, 2018 — A joint resolution to direct the removal of United States Armed Forces from hostilities in the Republic of Yemen that have not been authorized by Congress. Motion to Discharge Agreed to by a margin of 26 votes. Oct. 3, 2018 — A bill to provide protections for certain sports medicine professionals who provide certain medical services in a secondary State. Motion Agreed to by a margin of 87 votes. Oct. 1, 2018 — A bill to provide protections for certain sports medicine professionals who provide certain medical services in a secondary State. Cloture Motion Agreed to by a margin of 83 votes. Aug. 1, 2018 — To appropriate funds to carry out programs relating to the innovation, process improvement, and marketing of dairy products. Amendment Agreed to by a margin of 68 votes. Aug. 1, 2018 — To prohibit the use of funds to enforce standards of identity with respect to certain food. Amendment Rejected by a margin of 70 votes. Aug. 1, 2018 — To provide for election security grants. Amendment Rejected by a margin of 3 votes. 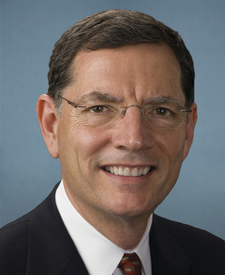 July 31, 2018 — An act to extend the National Flood Insurance Program, and for other purposes. Motion Agreed to by a margin of 74 votes. July 11, 2018 — A bill making appropriations for energy and water development and related agencies for the fiscal year ending September 30, 2019, and for other purposes. Motion Agreed to by a margin of 77 votes. Motion Agreed to by a margin of 91 votes. Nomination Confirmed by a margin of 45 votes. Cloture Motion Agreed to by a margin of 47 votes. June 28, 2018 — A bill to provide for the reform and continuation of agricultural and other programs of the Department of Agriculture through fiscal year 2023, and for other purposes. Bill Passed by a margin of 75 votes. June 28, 2018 — To provide for certain work requirements for able-bodied adults without dependents and to require State agencies to operate a work activation program for eligible participants in the supplemental nutrition assistance program. Motion to Table Agreed to by a margin of 38 votes. June 14, 2018 — To authorize appropriations for fiscal year 2019 for military activities of the Department of Defense, for military construction, and for defense activities of the Department of Energy, to prescribe military personnel strengths for such fiscal year, and for other purposes. Cloture Motion Agreed to by a margin of 66 votes. June 14, 2018 — In the nature of a substitute. Cloture Motion Agreed to by a margin of 69 votes. June 13, 2018 — To clarify that an authorization to use military force, a declaration of war, or any similar authority does not authorize the detention without charge or trial of a citizen or lawful permanent resident of the United States. Motion to Table Failed by a margin of 38 votes. May 23, 2018 — A bill to amend title 38, United States Code, to provide outer burial receptacles for remains buried in National Parks, and for other purposes. May 17, 2018 — A concurrent resolution setting forth the congressional budget for the United States Government for fiscal year 2019 and setting forth the appropriate budgetary levels for fiscal years 2020 through 2028. Motion to Proceed Rejected by a margin of 55 votes. March 22, 2018 — A bill to amend the State Department Basic Authorities Act of 1956 to include severe forms of trafficking in persons within the definition of transnational organized crime for purposes of the rewards program of the Department of State, and for other purposes. Motion for Attendance Agreed to by a margin of 85 votes. Dec. 6, 2017 — To provide for reconciliation pursuant to titles II and V of the concurrent resolution on the budget for fiscal year 2018. Motion Rejected by a margin of 2 votes. Oct. 23, 2017 — A bill to amend title 28 of the United States Code to authorize the appointment of additional bankruptcy judges; and for other purposes. Cloture Motion Agreed to by a margin of 63 votes. Oct. 19, 2017 — To establish a spending-neutral reserve fund relating to prohibiting Federal regulation of entirely intrastate species under the Endangered Species Act of 1973. Amendment Rejected by a margin of 2 votes. Oct. 19, 2017 — To provide for reconciliation instructions to the relevant committees for the purpose of repealing and replacing the Patient Protection and Affordable Care Act. Sept. 18, 2017 — To authorize appropriations for fiscal year 2018 for military activities of the Department of Defense, for military construction, and for defense activities of the Department of Energy, to prescribe military personnel strengths for such fiscal year, and for other purposes. Bill Passed by a margin of 81 votes. Cloture Motion Agreed to by a margin of 61 votes. July 28, 2017 — To strike the sunset of the repeal of the tax on employee health insurance premiums and health plan benefits. Amendment Agreed to by a margin of 4 votes. May 4, 2017 — To encourage effective, voluntary investments to recruit, employ, and retain men and women who have served in the United States military with annual Federal awards to employers recognizing such efforts, and for other purposes. Motion Agreed to by a margin of 61 votes. May 3, 2017 — A joint resolution disapproving the rule submitted by the Department of Labor relating to savings arrangements established by States for non-governmental employees. Joint Resolution Passed by a margin of 1 vote. March 30, 2017 — A joint resolution disapproving the rule submitted by the Department of Labor relating to savings arrangements established by qualified State political subdivisions for non-governmental employees. Jan. 10, 2017 — To strengthen Social Security and Medicare without raiding it to pay for new Government programs, like Obamacare, that have failed Americans by increasing premiums and reducing affordable health care options, to reform Medicaid without prioritizing able-bodied adults over the disabled, and to return regulation of insurance to State governments. Motion Rejected by a margin of 36 votes.